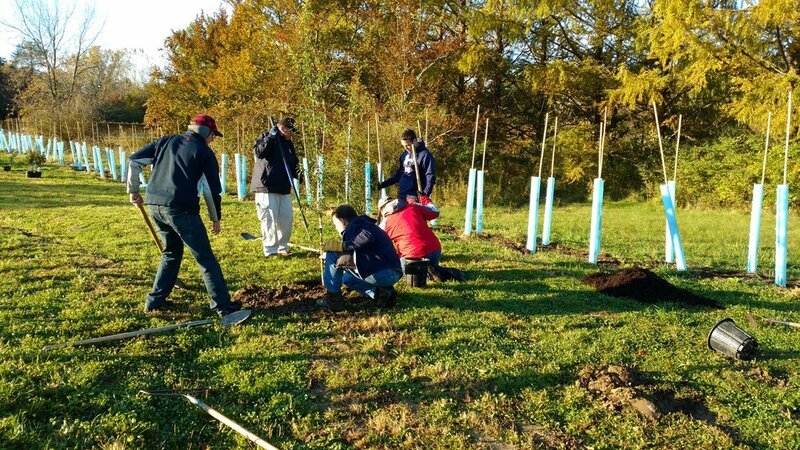 Over the past 30 years, The Greening of Detroit has planted more than 100,000 trees on city streets with a lot of help from our volunteers. The Greening also has an elite group of highly trained volunteers, the Citizen Foresters, that are responsible for leading groups of up to 20 volunteers on planting days. Citizen Foresters demonstrate best practices for planting a tree and are quality control supervisors and motivational leaders during our tree planting events in the spring and fall. Beyond tree planting training, Citizen Foresters can also receive training in volunteer management, community outreach, tree identification, maintenance and pruning. The Citizen Forester program is not just about planting trees. Citizen Foresters work in the community with a diverse group of local non-profits, corporations, community groups, and government agencies. Citizen Foresters are also a social group with regular meetups planned throughout the year. Becoming a Citizen Forester is a great opportunity to develop your leadership skills, gain experience managing volunteers, become familiar with different Detroit communities and meet others while working to make Detroit a greener place. Help us grow our positive environmental impact and join the best volunteer group in Detroit! Become a Citizen Forester today! The Citizen Forester Training will include information about The Greening of Detroit and all the community based resources we offer, volunteer management skills, and The Greening tree planting method. The lessons will be interactive and involve a tree planting. Become part of this prolific program while helping to bring the benefits of trees to Detroit neighborhoods! Citizen Forester Training 2019 is now accepting applications for our Spring session. If you are interested in environmental education, enjoy working outdoors, and want to be on the best volunteer team in Detroit, please fill out the application below! Learn more about the program and sign up below. Motivate and encourage volunteers to ensure a positive volunteer experience. You can visit the The Greening of Detroit's Facebook page here. Do you have prior experience landscaping, tree planting or leading groups of people? If so, please describe. Have you volunteered with the Greening of Detroit before? If so, please tell us when and how many times? Tell us about yourself! How do you spend your time and why are you interested in this volunteer position? I will be in contact with you as we get closer to our training date which has not yet been set. I will also let you know if we have any events related to tree planting and environmental education. October 2018 planting at Walter Meyers Nursery. A Citizen Forester demonstrates planting technique to a group of volunteers.